A Publishers Lunch Fall Buzz Book Don't miss one of the most heartwarming young adult novels of the year. 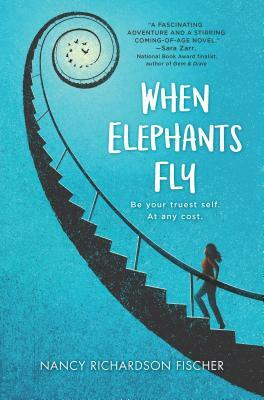 Perfect for fans of Water for Elephants, Wonder and All the Bright Places, When Elephants Fly shows that how we choose to live our lives matters, and that there are some battles worth fighting even if it means losing yourself. T. Lily Decker is a high school senior with a twelve-year plan: avoid stress, drugs, alcohol and boyfriends, and take regular psych quizzes administered by her best friend, Sawyer, to make sure she's not developing schizophrenia.Genetics are not on Lily's side. When she was seven, her mother, who had paranoid schizophrenia, tried to kill her. And a secret has revealed that Lily's odds are even worse than she thought. Still, there's a chance to avoid triggering the mental health condition, if Lily can live a careful life from ages eighteen to thirty, when schizophrenia most commonly manifests.But when a newspaper internship results in Lily witnessing a mother elephant try to kill her three-week-old calf, Swifty, Lily can't abandon the story or the calf. With Swifty in danger of dying from grief, Lily must choose whether to risk everything, including her sanity and a first love, on a desperate road trip to save the calf's life, perhaps finding her own version of freedom along the way.